I always though this was an interesting system. 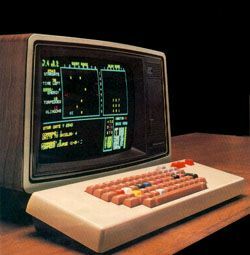 It was a color system and unlike my Apple ][, included color text. One draw-back to the system was the built-in floppy drive. You couldn't format your own diskettes, the company didn't release the disk formatter and tried to force you to buy formatted diskettes from them. Many users ended up writing their own formatting programs. So, does someone have one of these hidden away somewhere? If, by some really strange piece of luck you do, tell me about it. It will take me a little time to sort and catalog everything that came with this system.